Nationwide Arena is the home of the National Hockey League's Columbus Blue Jackets, the Arena Football League's Columbus Destroyers, the United States Hockey League's Ohio Junior Blue Jacketsand a wide variety of world-class entertainment events. Nationwide Arena is the only building in the National Hockey League that has the team's practice facility, Dispatch Ice Haus, attached to the arena where the team plays its games. The Dispatch Ice Haus is not only the practice home of the team, but is open to the public as well. Get a behind the scenes look at the arena with a guided tour of this unique venue. Group tours are available for 10 or more people and they must be scheduled 30 days in advance and are not available on scheduled event days. Tours are available Monday through Friday between the hours of 8 a.m. and 5 p.m. Call the arena (614) 246-2000 to make arrangements for your group. 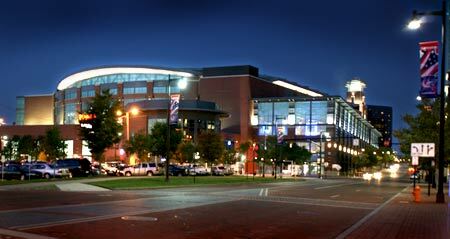 Nationwide Arena provides one of the best hockey fan experiences in the country. There are no bad seats. When planning a hockey game night, give yourself plenty of time to see the arena and get used to the layout and where everything is located. There's plenty of kiosks selling all types of food, and visit the Blue Line for souvenirs. Dress warm. The arena on game nights is downright cold: 58 degrees which is great for a hockey game. The first concert held at Nationwide Arena was a performance by country-western singers: Tim McGraw and Faith Hill on September 9 and 10, 2000. The first exhibition hockey game was between the Blue Jackets and Detroit Red Wings. The first regular season game was held on October 7, 2000 against the Chicago Blackhawks. The Blue Jackets are not the first professional hockey team in Columbus however. In the 1960s, the IHL had the Columbus Checkers that played at the Fairgrounds.